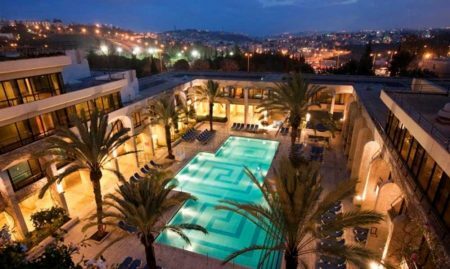 This two day tour combines the Jerusalem & Bethlehem Tour with the Masada & Dead Sea Tour and one night in a tourist level hotel in Jerusalem. The tour begins at the Mount of Olives with a breathtaking panoramic view over Jerusalem. Then we continue on to the Byzantine Cardo, an ancient main road which runs through the Jewish Quarter of the Old City of Jerusalem. We take a look at the Wailing Wall (Kotel) and then follow the sacred route Jesus took carrying his cross along the Way of Sorrows (Via Dolorosa). We stop at several of the Stations of the Cross and reach the Basilica of the Holy Sepulcher where Jesus was crucified and where his burial tomb is located. We take a stroll through the bazaars of the Christian and Muslim quarters and then leave Jerusalem and make our way to Bethlehem. Our journey begins at the Mount of Olives overlooking the ancient Jewish cemetery where it is believed that the resurrection will begin when the Messiah comes (Zech 14:4). From this elevated location we can see across the Old City and down to the Temple Mount where the holy Jewish Temple once stood. We continue on towards the Zion Gate by driving through the Kidron Valley where we see the Garden of Gethsemane, the Church of All Nations and the Jewish burial tombs of Absalom, King David’s son, Jehoshaphat and the Hezir family (benei Hazir). At the Zion Gate we enter Jerusalem’s Old City and make our way through the Armenian Quarter. Then we follow the 1,500 year old excavated Byzantine Cardo which has been restored and is now home to modern shops which line a section of the ancient road. We carry on through the Jewish Quarter and on to the Western Wall which was part of the supporting wall of the Temple Mount when the second holy Jewish Temple that stood on the expanded hill almost 2,000 years ago. We then walk where Jesus once walked the Way of Sorrows along the Via Dolorosa, as thousands of pilgrims do each year. We stop at several of the Stations of the Cross where Jesus stopped briefly as he carried his cross to Golgotha (Calvary). The final station on this Way of Sorrows is at the Church of the Holy Sepulcher where Christ was crucified and where his burial tomb is located. The Basilica was constructed during the Byzantine Era and underwent renovations and reconstruction over the years. 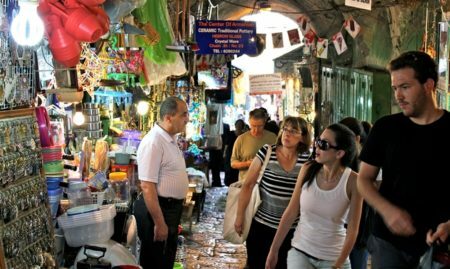 Before we leave the Old City we meander through the typically Middle Eastern markets and then set off for Bethlehem, the city of Christ’s birth. We arrive in the City of Bread, Bethlehem, which was home to Jesse, King David’s father as well as being Christ’s birthplace (Matthew 2:1). From Manger Square we enter the 4th century Church of the Nativity which is the oldest church in Israel still in use. Beneath the church is the Grotto of the Nativity where a star indicates the place where Jesus was born. Also in the Orthodox Church are the Manger and an alter dedicated to the Three Wise Men. This is the place where the well known story of Christmas night took place and a visit here is a moving experience for all Christians. The Church of the Nativity was neglected for centuries following the expulsion of the Crusaders, it also was damaged by an earthquake and fire. However during the British Mandate and more recently under Israeli authority the church has been restored and repaired. On the way out of the church we see the Armenian Chapel of the Kings or Magi and we visit the Crusader Church. From the Church of St. Catherine we go down into a two room cave which joins the Grotto of the Nativity. It was here that Saint Jerome spent 30 years translating the Hebrew Bible into the Latin version called The Vulgate. This is the perfect place for us to take a moment and sing some Christmas carols. At the Franciscan Church we see the Milk Grotto where Mary fed baby Jesus and a drop of milk fell onto the stone turning the grotto white. In Luke 2:8-11 we read of an angel appearing to shepherds who were tending their sheep in a nearby field. We stop to see Shepherds Field, and the contemporary Church of the Angels designed by Antonio Berluzzi with panels retelling the story of Jesus’ early life. On our way back towards Jerusalem we pass the Field of Ruth. Here Ruth, King David’s great grandmother, worked in the fields of Boaz. (Ruth 2:1). It was on Masada that the first parchment from this era was discovered in an Israeli archaeological excavation. On the parchment was the prophecy of Ezekiel “…I will take the children of Israeli from among the nations…and bring them into their own land…” (Ezekiel 37). To end off a perfect day we stop at the Dead Sea, the lowest point on Earth and a contender for the title of one of the Seven Wonders of the World. People come from across the globe to enjoy the therapeutic mineral rich waters. And don’t worry if you don’t know how to swim – the high salt content will keep you afloat. Price includes accommodations per person in a double room on bed and breakfast basis. Airport drop off and other drop off locations are available for additional 65$ per person, which can be added online when you make your ticket reservation. The second day tour can be exchanged with a Dead Sea Relaxation Tour. No refunds for tours that include flights and accommodation.